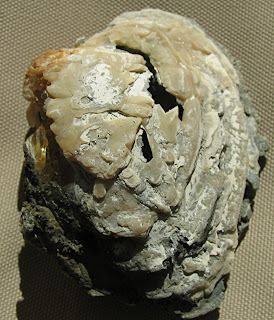 The Giant Venus Clam fossil (Mercenaria permagna) found in the Fort Drum Member, Nashua Formation of Florida. 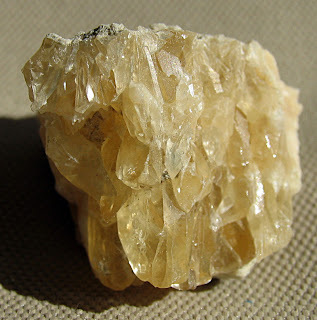 It was described by Conrad in 1838 and can also be found in North and South Carolina. This creature lived in the Calabrian Stage (780,000 years ago to 1.8 million years ago) of the Pleistocene Epoch of the Quaternary period. 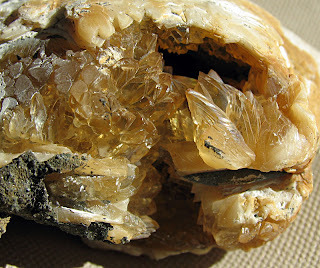 I have not tried it but I read on the Internet that this fossil will fluorescence green-yellow when exposed to UV light. 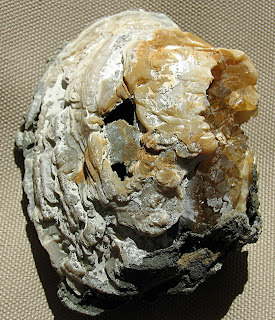 Learn more about these fossils at Apalchee Minerals website where they do not sell this fossil cheap! 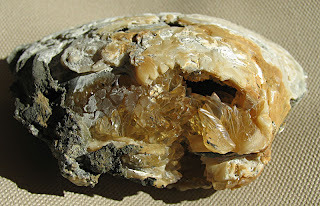 Honey colored calcite chunk from inside of a clam.